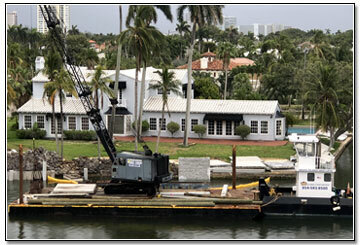 Seawalls, quite possibly are the single most expensive property repair that any water front home owner may encounter. Seawalls cost more than swimming pools and roofs. The investment you make to perform routine or required maintenance may save you the thousands of dollars in the long run. Most seawalls in Florida are built of concrete panels or limestone rock grouted together typically called “coral rock walls”. Erosion, tidal action by nature, or boat wakes poses a serious threat to any seawall and separates the strong and healthy seawall from the weak ones. Summer storms in South Florida are notorious for dumping 3-6 inches of rain in just a few hours. This extreme load of water running off your roof, from your pool, or just a sloping back yard will test your wall to its limits. ● Are there depressions appearing in the yard adjacent to the wall? ● Is the soil disappearing? ● Are there cracks in the cap of the wall face itself? ● Is your wall dipping, sagging, or even worse, bowing outwards? Any of these conditions could mean you have serious seawall issues that should be addressed. Sealing and patching is a common maintenance practice. All walls have sections between panels, loose rocks, cracks, holes, or loose joints. All of these minor issues can be corrected by installing high strength marine grout to the affected areas. The grout will prevent sea water from flowing through the wall and eroding away fine sand and soil from the yard and under the wall. Second most common repair is footers. Often times the depth or penetration of the seawall no longer extends below the “berm” or base of the canal bed. This is called undermining caused by tidal erosion or upland pressure pushing sand fill out under the bottom of the panel. A typical repair is to drive aluminum or vinyl sheet piling in front of the existing wall to form a row. When the driven row is in place pumped concrete will be installed to fill in the area created between the wall and new footer sheets. The driven sheets extend the depth of the wall. Another more costly repair is called batter pilings. Often times an old wall will show signs of leaning outward by as much as a foot or more. Causes usually are due to upland pressure brought on by pool construction or heavy loads like garden walls or big trees. A batter piling is a 12” x 12” concrete piling driven in front of the wall at a 30 degree angle spaced every 10 feet. With the new batter pilings installed a new concrete cap can be formed and poured over them to connect the old wall to the new supporting batter pilings. The photo on the top of this page shows our barge and crane at work. Morrison Contractors is equipped to handle any and all needs that may arise. 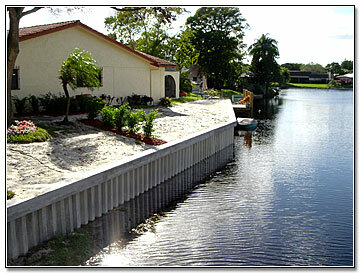 For any type of Florida seawall inspection, repair, replacement, or questions please contact us for a no cost estimate.